We recognize that each company is unique and there is no ‘one-size-fits-all’ approach to customer experience. Based on our years of experience, we have developed a straightforward framework that can help any company as they embark on their own customer experience journey. Poor customer experiences can be costly. They can convert advocates into critics, increase the costs to attract and serve, and can significantly reduce the customer lifetime value. Great experiences can deliver lasting results. If customers have a clear understanding of what your business offers—and why you are different—they’ll come running. We have four core offerings to take you from discovery to vision to strategy to implementation. Each offering has been designed to provide a blend of strategic thinking and delivery capability. We rigorously assess your individual needs, considering several factors such as your corporate culture, corporate strategy, maturity of existing customer experience efforts, and your customer touch points across channels. We can quickly identify potential issues and gaps that help determine where our expertise can help you most. 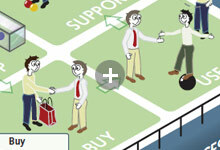 Read our 9 Steps to delivering the right Customer Experience for your customers.